Now that the initial cries of "HOLY COW" (or substitute other words for cow, your choice) that rippled throughout the Bicycle Coalition and it's partners' offices last week have died down, I want to offer a few thoughts about the incredibly cool TIGER award that Philadelphia and Camden won last week. First of all, all the counties and agencies that participated in the initial proposal submitted back in September should take great pride that in this award. It was the regional aspect and collaboration amongst 6 different governmental agencies that made this application stand out all the others. The odds of winning were slim. 1400 applications were received by USDOT. Approximately, $60 Billion (Billion with a B) dollars worth of projects were vying for $1.5Billion. When we heard that figure back in November, we knew it was a long shot. So, the fact that this regional application was awarded $20.2M out of $36M requested is stunning. Only 51 projects (3% of those submitted) were selected. Only two bicycle/pedestrian networks were funded, ours and Indianapolis. Those two projects were 3% ($46M) of all TIGER funding, which sounds small, but 24 of the 51 had some bicycle/pedestrian component. According the America Bikes, "TIGER contributed $405 million to job-rich, green infrastructure projects such as building and improving sidewalks, curb ramps, bike lanes and multi-use trails." Clearly, this TIGER program reflects a federal policy shift away from car-centric projects. While the odds were small, many of us who worked on getting this application together knew in our bones that completing the Schuylkill River Trail, East Coast Greenway and Camden GreenWay truly embodied the goal of the TIGER program: nationally, regionally, or metro-significant projects that facilitate linking transportation, housing, energy, and environmental concerns and were judged on criteria based on livability, sustainability, safety and economic development. The application submitted by the six counties made the case that completing a network of trails met those criteria. We were sure that we had a good shot, even if it was a long one. Plus, it helped that 59 elected officials, institutions and organizations sent USDOT supporting letters. We owe a big round of thanks to all those who did so. As said in an earlier post, this is the first victory of what we want to be many. 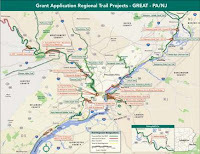 There are more gaps on the Schuylkill River Trail and East Coast Greenway in Philadelphia, Montgomery, Delaware, Chester, Bucks, Berks and Schuylkill Counties to close; we have years of more work to do before one can bike from Fort Mifflin to Pottsville or Trenton. On Thursday and Friday of last week, many organizations submitted appropriations requests for those remaining trail segments that didn't get included in the TIGER grant. It is so gratifying that after one year of working collaboratively and strategically, the non-profit community and local and county governments have broken the funding drought that trails have experienced for at over a decade. If we keep this winning collaboration going, we are bound to achieve our goal of a connected regional network of biking/walking trails. Too bad that the comments in all the paper that covered the winning of this awards considered this a great example of wasteful government spending. I'd hate to see bicycle and pedestrian issues become another partisan issue more so than it already is.